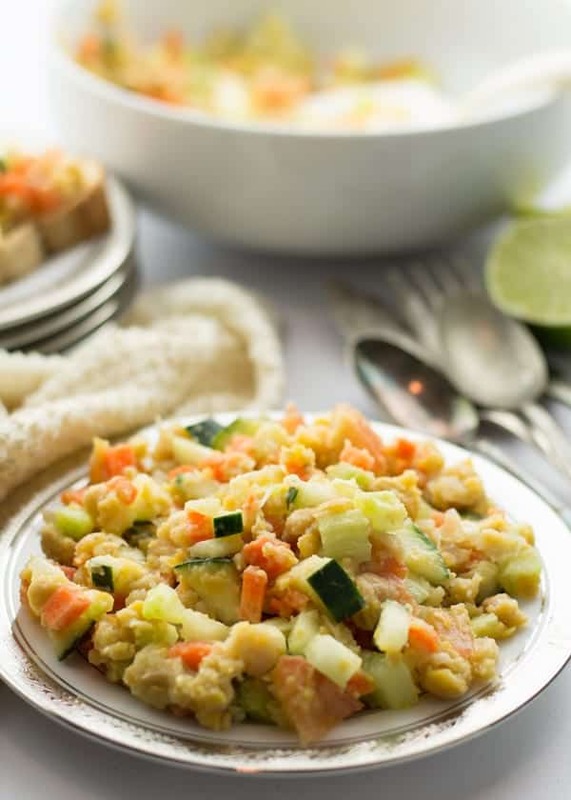 Mashed chickpea salad, is a satisfying and most comfortable recipe. Which has became one of my favorite recipes now. This is the most one of the easy and most versatile recipe that can transform into any form. This can be modified into a healthy stuffing for your sandwich, wrap. Or can be served as a guilt free and gluten free dip for any appetizer. It made with most vibrant ingredients. Yes, it is made with all the garden fresh vegetables. 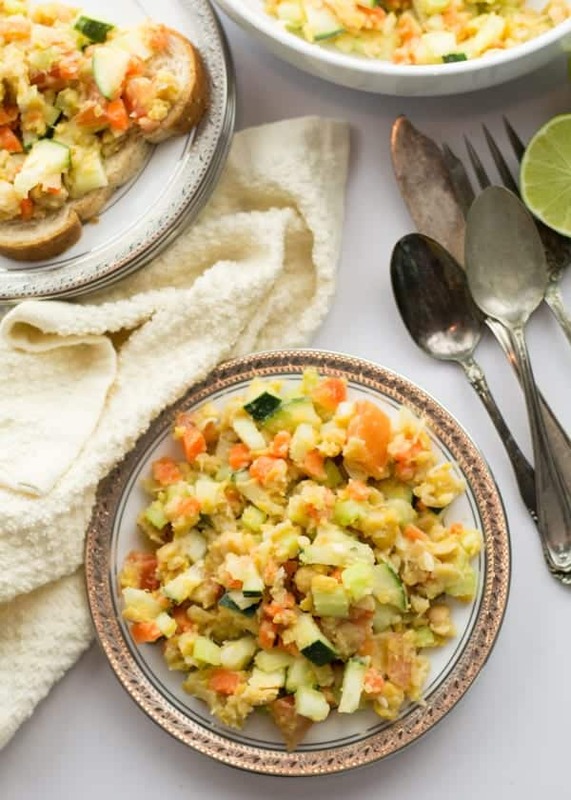 And it is spring time, you will get variety of vegetables perfect for this mashed chickpea salad. 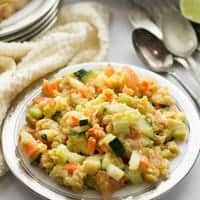 I made my mashed chickpea salad with cucumbers, celery, carrot, tomato and onion. But the you may add any vegetable that is available to you. You may throw in avocado, or asparagus or beets or any other vegetables. Want to sit back and relax? serve this salad as a wrap. Without compromising on the taste or healthy facts. A guilt free salad recipe is a simple and straight forward dish. Enjoy this dish without worrying about the calorie and the fat. Spring brings all the vibrant vegetables to the market. And I cannot stop myself grabbing all the vegetables by looking at its freshness. Buying all the vegetables does not mean that I’m going to spend my entire day in the kitchen to cook and clean. Another factor I was diving into vegetables is that I really want to shed my winter pounds. I do not really want to stuff myself more weight with unwanted fatty food. And was looking out for interesting and simple recipes where I could use vegetables to make my dish skinny. Finally I found this mashed chickpea salad recipe which is nearer to my heart. This mashed chickpea salad is the another solution for my today’s problem. I started making wholesome healthy salads which I want to feel full and also healthy. Which could provide me all the nutrients I want for the day. So that I can munch on and on until I feel full. I do not want to stuff my tummy with other stuff which tends to increase my weight. A great advantage, having this is a basic ingredient you can make your number of other recipes. Give your regular dish a make over with smashed chickpea salad. And create a more refreshing experience for everyone. Chickpea also called as garbanzo beans which are available in all the stores. It is a great source of protein, good for all ages. Make this for parties or for a large crowd with the most refreshing ingredients. Perfect on the go food for summer with wrap or sandwich. I have added, fresh vegetables. You may add mustard sauce to give it a punch. I have not added Tahini sauce, mayo or any cheese to make it low calorie as far as possible. Believe me this Mashed chickpea salad tasted really good. But you may add it your calorie chart permits. You may add greek yogurt to make it blended and creamy. Soak the chickpea for 8 hours. If you are using pressure cooker, cook it in medium flame for 15 minutes. If you are using Instant pot, cook it in manual timer for 15 minutes. And if you are using slow cooker, no need for soaking. Add chickpea and 2.5 times water with salt. Let it cook for 4 hours and until it gets cooked soft when touched. You may also use canned garbanzo beans otherwise also called as chickpeas. Chickpea need not be crushed smoothly. It can be coarse with visible chunks. Add all the vegetables and combine them well until all the ingredients blends with each other. Store the leftover in airtight container in refrigerator. And it is good to use for couple of days. 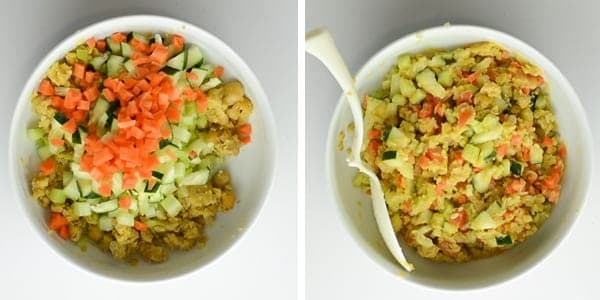 Mashed chickpea salad, a Mediterranean style vegan recipe. Made with cucumber, carrot, tomato, onion. Serve this salad as warm or cold. A healthy, low calorie vegetarian dish perfect for sandwiches and warp. In a mixing bowl, add cooked chickpea. Mash it until it becomes coarse. Add chopped cucumber, carrot, onion, tomato, salt and lime juice. You may add mustard sauce to add spiciness. You may also also tahini sauce, mayo or feta cheese to make this salad more exotic. Substitute green peppers with jalapeno to add heat. Liked this recipe? Follow us on Facebook, Pinterest, Instagram. This is a great recipe. I love kikärtor (chickpeas) as we call them here, but I must admit I rarely cook them from dry. Doing them in the Instant Pot is brilliant. Thanks for the tip. 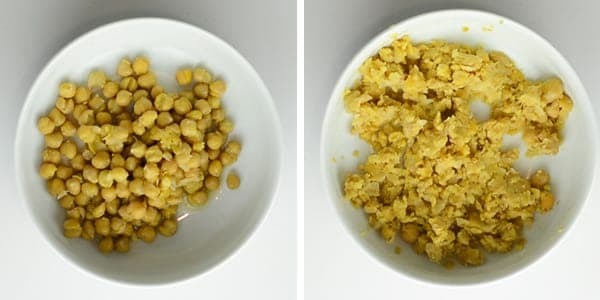 Thanks Ron, Cooking chickpea in instant pot is the best comparing to regular pressure cooker. Where you have full control in the temperature and the time.